WMLongLife is an automatic 2G/3G band-switching solution. 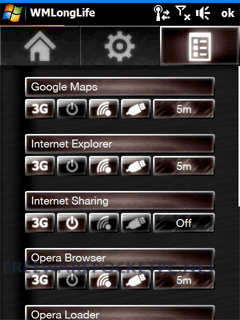 It will keep your device in 2G when you do not need to use 3G, and will switch to 3G automatically when you do need it. For most users, having your device in 2G uses much less battery, and thus your phone lasts longer on a single charge. 2G also usually generates less radiation than 3G, so it will likely be better for your gonads (if you have them) as well (see this thread for a discussion about that) - think of your hypothetical future children! Imate users,.please dont install this APP,. I just installed the same and now my Imate ultimate 8502 will not go further than the blue imate Logo. my Phone is now not usable. tried to reset it but of no use, any suggestions ? Confirmed working on sprint HTC touch pro 2, running "Sprint Basics 1.4 Visual Kitchen - WM 6.1" ROM. 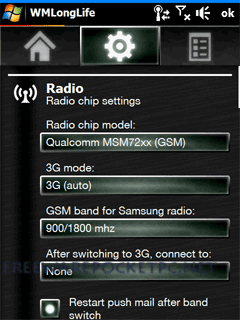 Keep your 3G mode on auto, then everything should work flawlessly. I haven't done a research about the battery improvements, but at least it doesnt warm up my device when running in 2G mode. This software automatically switch to 3G mode when running bandwidth hungry apps like youtube, opera, google maps, etc, but then switches to 2G when closing it. I dont even have to lose my internet connection for some less hungry apps like seven (push email), and azurea (twitter client). I really love this freeware. For those who aren't succeeded installing this sofware (maybe due to incompatibility of ROM they are using, which happened to me on Energy ROM), do not worry! THIS FREEWARE WONT KILL YOUR 3G MODULE !!!!! It only switches your band preferences. To retrieve your band preferences back, all you have to do is uninstall WMLonglife, then go to EPST menu (on my device, you just dial ##778#). Enter your SPC Code (for those who arent familiar with SPC code, just use free software like CDMA workshop to get your device's SPC code). Go to modem settings, and set your preferred mode (automatic, cdma, cdma HDR, etc) @Khurram : Virus ought to be really good to destroy hardware, man!! Did anyone have any issues with this app on there hd2? it works perfectly for me (SE X1), thx a lot!! Please do not install this software on your mobile !!!! it is very dangerous !!!! you will loose the possibility to use 3G connection forever DO NOT USE IT !!!!! GREAT APPLICATION. BASICALLY A MUST HAVE! !